Last year, more than half (52%) of the average daily share volume in US equities was from high-frequency traders, according to the TABB Group. Today’s markets move at lightning speeds, but this wasn’t always the case. Market makers used to track trades on paper and match orders by hand. 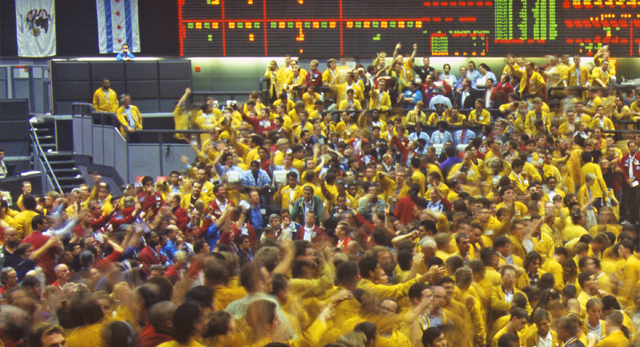 Traders stood in the pit, with specialists communicating through hand signals and by yelling. A key competitive advantage was a voice that pierced the noise. Today’s high-frequency traders entered the scene in earnest only 10 to 15 years ago. “There is no definitive date on which high-frequency trading was born, but the general view is that HFT in the US equity market is an outcome of Regulation NMS, adopted in 2005 and fully implemented in 2007,” says Haoxiang Zhu, assistant professor of finance at MIT’s Sloan School of Management. High-frequency traders typically begin and end the day with almost no inventory and execute trades at a very fast speed because of technology like field-programmable gate array (FPGA) cards, microwave links and co-located servers. In the blink of an eye, a high-frequency trader can execute hundreds of trades, earning a fraction of a penny on each. The first high-frequency traders arbitraged futures contracts on stock indexes like the S&P 500 and the Dow Jones Industrial Average against the basket of underlying stocks, by calculating the indexes faster than the exchanges or predicting where futures prices would move. Traders looked at both sides simultaneously. With the arrival of the new information, the futures price might move immediately, but that might not be immediately reflected in all the underlying stocks or vice versa—that price difference is where the arbitrage occurs. 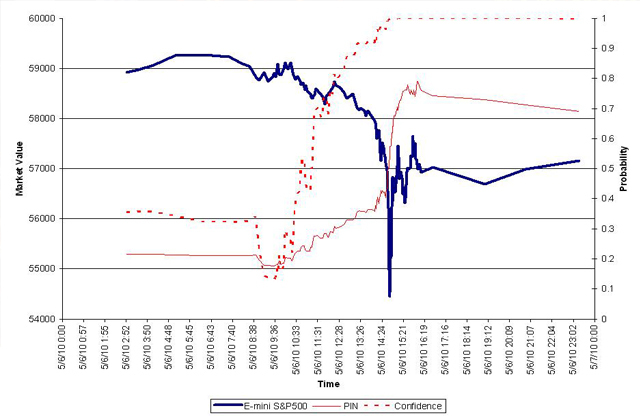 A graphic of order-flow toxicity during the US flash crash of 2010.